After years of climbing exclusively in the Chalten Massif, I have finally exposed myself to another location in the Patagonian Andes. I spent most of November underneath Cerro San Lorenzo, Patagonia’s second-highest peak, with my longtime friend Rob Smith. 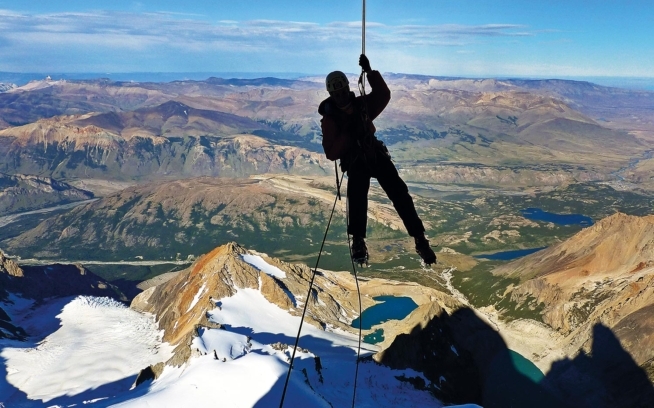 While El Chalten becomes a bit more like Chamonix every year, the rest of the Patagonian Andes maintain a similar climbing experience as twenty years ago, except that now one can get weather information via satellite phone. Editor’s note: Patagonia climbers will once again be sharing photos and stories for the duration of the climbing season in Patagonia. See it all on the Vida Patagonia trip page at Patagonia.com or follow #VidaPatagonia on Instagram. On November 10th we hired a pickup truck ride from Gobernador Gregores into Perito Moreno National Park and got dropped off at the end of the road. It took three trips over three days to haul all our gear and food into basecamp—an old hut, known as Puesto San Lorenzo. For the entirety of our three-week stay we did not see a single other human, although we did see tons of guanacos, and saw fresh puma tracks nearly every day that we hiked in the lowlands. We were pretty unlucky with the weather during our trip. Although our basecamp was quite close to Cerro San Lorenzo, we could only see the mountain at all on a handful of days, and even on those days the upper ridges and summit were enveloped in an enormous lenticular cloud. There were two 15-18 hour periods of actual good weather during our trip, neither of which we were able to profit from, and one semi-decent day on which we did manage to climb. The vast majority of our trip was spent hiking with heavy backpacks, and navigating the best access to various climbing objectives. There are no trails in the area, and during the course of our trip we waded through no fewer than 19 river crossings. There is good bouldering near basecamp, but it requires wading through a thigh-deep river to access, and was being rained on every day that we weren’t climbing, approaching to climb, or trying to climb. The first of 19 times wading through rivers. Rob re-warming his legs. This was the coldest river crossing I’ve ever done. 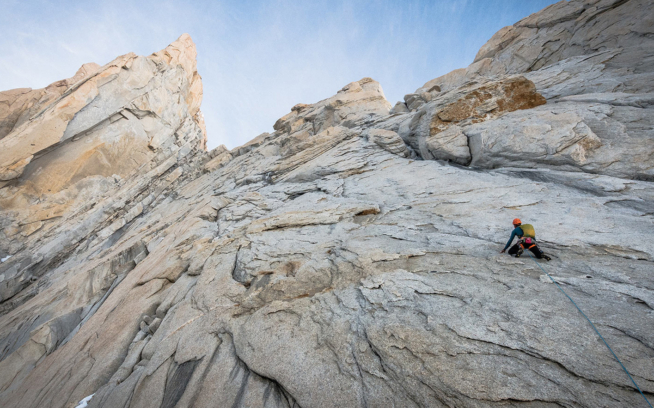 It was impossible to not be constantly comparing our experience at San Lorenzo to the modern climbing experience in Chalten. At San Lorenzo it felt like we were putting in an enormous amount of effort towards our goals, with little reward, and all the while slowly destroying our bodies with heavy packs. In Chalten the approaches are easy by comparison, there is little load-hauling to do, one can stay fit with lots of bouldering and sport climbing, one can eat a healthy diet, and there are plenty of people to socialize with. The trade-off, of course, is that nearly all the big faces in the Chalten massif have been climbed, while at San Lorenzo there are several very big, very difficult, untouched faces. San Lorenzo is about big adventure, and Chalten is about ease of access to amazing alpine climbing. Rob was a great partner for the trip. Expeditions to remote places with no other people around, especially when the weather isn’t in your favor, are often the most trying circumstances for climbing partnerships. Rob is not only very easy to get along with, but remained fully motivated despite our climactic setbacks. While we only got to climb one day, I can say with satisfaction that we put in our best effort for the entirety of the trip, and did as well as we could’ve with the cards we were dealt. For me the most appealing objective in the San Lorenzo massif is the massive rock tower at the far south end of San Lorenzo’s south ridge. I think it is quite likely the most difficult unclimbed mountain in Patagonia. The northeast face is at least 1,000 meters tall, and I would guess more like 1,300 meters. There are two summits, of which the west summit is the higher one. The downside is that the rock is much lower quality than in the Chalten massif. A view of Aguja Antipasto and the big unclimbed tower from near the base of the South African route. Although both summits look roughly equal in height from this angle, the west summit (the sharp needle) is the higher one. November 20 was the first of our two 18-hour periods of good weather, and we made a brief attempt on the large tower. From a bivy on the main glacier below the tower we gained about 600 meters of elevation in terrible snow conditions to the base, arriving just as sunlight was hitting the upper east faces. Unfortunately, our chosen line started up a large east-facing gully system, and at the bergschrund it felt clear that the temperature was too high for such a terrain trap. The day before it had been snowing down in basecamp, but with the clear skies came much higher temperatures. We descended back to our bivy down on the flat glacier, and unfortunately passed the best weather day of our trip taking naps in the tent. We did, however, watch an enormous number of avalanches that day, easily reassuring us that we had made the right decision. Rob approaching the big tower at dawn. Colin at the bergschrund where we decided it was too warm for our intended line. The weather forecast was for significantly worse weather the next day (Nov 21), and we were running low on food, but we decided we still ought to try to climb something, as we felt it might be the only chance of our trip (and this turned out to be the case). With the marginal weather forecast we turned our sights to the sharp spire just below and east of the main spire. It is dwarfed by the main spire, but would look proud in most other surroundings. On November 21, we left our glacier bivy very early (around 2am I think), crossed some flat glacier, and then kicked steps up a roughly 500-meter approach buttress to the base of the spire. We climbed the spire via what can be roughly described as the east ridge, but is really more of a face than a ridge until the last few pitches. The middle portion of our route follows an ice gully, which was unfortunately decomposing into slush. This made for one section of M5R that probably would’ve been only AI3 two days earlier, and required us to deviate from one very nice-looking steep ice pillar, that did not seem safe in its molting form. Our deviation involved some 5.10 rock climbing in monopoints, although I’m not sure we went the best way. The last three pitches that we climbed to the summit were only 5.7-5.9, but were the crux of the route due to the poor rock. The protection was sparse, and one had to climb delicately around many loose blocks—slightly more difficult in crampons than it would’ve been in rock shoes, but it was much too cold and windy to wear rock shoes. It was windy and cloudy the entire day, with Cerro San Lorenzo itself enveloped in its usual lenticular cloud cap. The summit of the spire was spectacularly sharp, and we tagged it one at a time. The descent took some time, as we rappelled all except 50 meters, and rappelling a mountain with zero previous anchors is of course a long process. We finished the rappels shortly after dark, descended the approach buttress quickly and easy, and made it back to our bivy roughly 22 hours after leaving. It seemed slow for the size of the objective, but the poor rock quality required slow climbing. I estimate that the technical portion of our climb was roughly 500 meters, but these things are difficult to gauge, and it could easily be as small as 400 meters or as large as 600 meters. We climbed 14 pitches on the ascent, and made 12 rappels on the descent. The difficulties we encountered were up to M5R and 5.10, with a handful of A0 moves scattered throughout wherever it seemed most efficient (which wasn’t often, due to the dubious rock quality). We named our route “Romance Explosion,” and named the spire Aguja Antipasto—mostly a reference to it being merely an appetizer in comparison to the main course just behind, but also a food reference. We ran out of food several pitches before reaching the summit, and didn’t get more until arriving back in basecamp, roughly 24 hours later. Rob traversing a snow ridge to the start of the technical climbing on Aguja Antipasto. Colin climbing easy, chossy terrain on the first rock band of “Romance Explosion,” heel-hooking in Baturas! Colin climbing a bit of 5.10 face to avoid the decomposing waterfall pitch. Colin heading up the second of the three summit choss pitches. Colin tagging the summit of Aguja Antipasto. Looking down our route from the summit of Aguja Antipasto. Aguja Antipasto on the left, showing the line of “Romance Explosion,” with the big, unclimbed tower on the right. After our hunger games on Aguja Antipasto, we spent two days eating ravenously in base camp before the forecast showed signs of hope again. For our last shot we set our sights on the South African route, which climbs the ENE ridge of Cerro San Lorenzo. 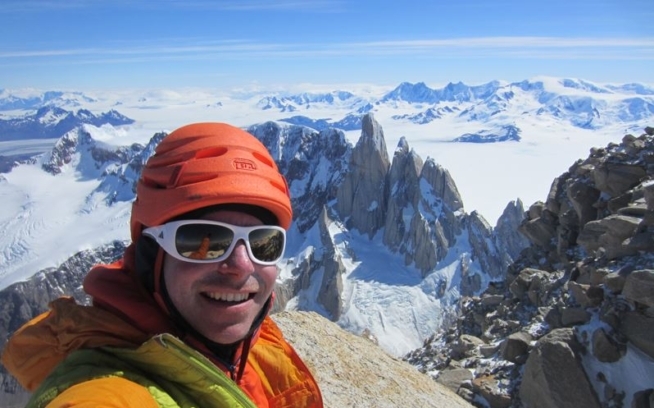 To me it seems like the classic of the region, and perhaps could be considered “the Cassin of Patagonia.” There are several similarities to the Cassin Ridge: It looks to have almost zero walking terrain, yet minimal technical difficulties. It is big, serious, and takes an aesthetic line straight to the summit of the biggest mountain in a vast area. On November 25, the day before the most promising day in the weather forecast, we hiked from basecamp to a very nice bivy on gravel just below the South African route. It was ballistically windy all night, and we started to think less about climbing the next day, and more about the possibility of our Firstlight tent exploding. Due to the wind we didn’t manage to fall asleep until around 7am. At 9am we woke to clear skies, and although it was still windy it seemed to be slowly abating. We briefly considered starting up right then, but after only a couple hours of sleep we decided instead to nap and rest up. We set our alarm for 11:30pm on Nov. 26, and by 12:30am on the 27th we left our bivy with very little wind and stars visible. Within 30 minutes all the stars had disappeared and the wind was beginning to pick back up. Well, what the hell, we kept going figuring that it can always change for the better. We broke trail for about 600 meters vertical from our bivy to the bergschrund, and during that time the wind became more constant and it started to snow, at times heavily. For the second time on our trip we bailed at the bergschrund, and again did not regret it, as San Lorenzo ended up socked in cloud all day long, with precip on and off well down-valley. We began the long, tedious process of extracting ourselves and all our equipment back to the end of the road. Rob near the bergschrund on the South African route, shortly before we pulled the plug. The hunger games have taken their toll on mind and body. Back at the Puesto San Lorenzo after bailing from the South African route. Our perspective would certainly be different if we’d had better luck with the weather, but both Rob and I felt unsure if we would want to return to Cerro San Lorenzo. The heavy pack hauling is the biggest detraction for me. However, there is no lack of very big, difficult objectives there, for those who have the “hunger” required to climb there. We owe a big thanks to Rolo Garibotti and Seba Perroni, who immensely helped us with logistics and weather forecasts! This story was first published on December 10th, 2014 at colinhaley.com. Visit the 2015 Vida Patagonia trip page at Patagonia.com or follow #VidaPatagonia on Instagram to see live updates from climbers in the Patagonia region all season long.